Quick question on the turntable concept, are camera zooms and pans allowable during the rotation or should it be a strictly fixed camera? Heck, I'd say have some camera fun! I intend to! I wanted to make a very goofy looking car into a vicious killing machine. That's how I got to a three-wheeler, they just look so funny.. and what's more innocent than a three-wheeler? A three-wheeler from a bakery.. I wanted to keep the modeling simple a bit this time so nothing fancy. It is all modeled in Anim8or, then exported to 3d Studio Max and rendered the whole video in Vray. I changed the colors and contrast a bit in Photoshop afterwards. For the beauty render I made the basket, breads and grains in 3d Studio Max. The logo was taken off Google so I can't take credit for that. Good luck to all of you finishing your entries! because is very realistic render!! As usual, $imon and Ensoniq5 produce some fine, original material that is great to eyeball over and over. Gyperboloid, your machines are a bit too dark to make sense of. $imon: Excellent idea, lovely clean modelling as always. I love how the turntable is a circular section through a road, kerb and all. Brilliant! I'd love one of these vehicles for the Monday morning traffic crawl... blast my way through! Arik: My sure fire remedy for that sort of thing is Jalapeno pizza and plenty of orange juice and tequila! Not sure if it actually works, but the tequila ensures you don't feel a thing! Looking forward to seeing your work, looks cool so far. haha I like where that is going, arik. The fever must be good for the inspiration! (I should try it myself...) I'm not sure if Ensoniq's nutrition suggestion is one to follow though lol. 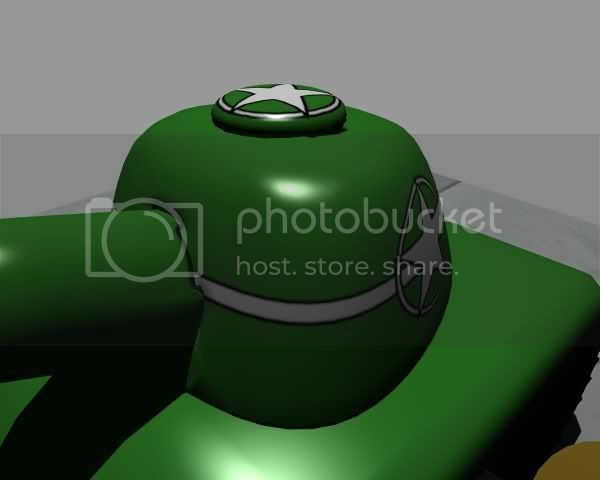 There is some distortion on the model where the barrel meets the tank though. maybe you could look into that. Oh I dont think this is your final render yet, but in the dark parts its a bit hard to make out the details, maybe try to up the ambient intensity in the scene lighting settings, or the ambient value of the materials? Sorry i didn't reply to your model yet, Ive been a bit busy.. It's looking great! I hope you will change the camera angle a bit for the final turntable though, it looks a bit like a miniature model at the moment.. I like the blocked camouflage! It looks battle-ready! Good luck finishing..
Ps. I'm like you - not a big fan of making weapons etc. but once you start it looks cool pretty fast haha. 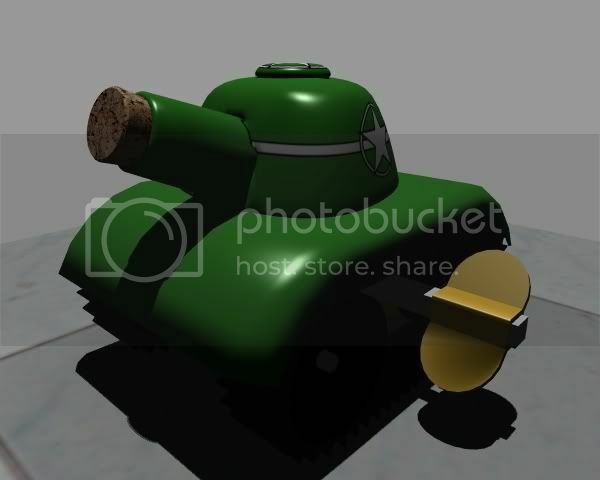 $imon, by distortion do you mean the areas where the barrel sink into the turret? If so, maybe this shot helps better portray what I'm attempting. This is styled after those wind-up tin toys that were made "a bit before your time." Thus, the slots in the turret and the tabs that insert from the barrel (and hatch on top). I made the tabs as if actually bent inside the turret as if holding the pieces together. Otherwise, I'm not sure what you mean by distortion. Oh that makes a lot more sense, Arik You're right - I played with lego's when I was young, and even thats old at the moment.. But I cant really make it out.. I'm sure youve got it under control haha. Just hope the fever won't catch up to you! Heh... call it a dent in the metal? @Simon: Great work. I knew something was going to rise from the roof hatch, but side guns were total surprise. Your machine is not just war machine. It is infact Mafia War Machine, waiting to take out the entire gang. I have not yet posted any WIP, but I am happy I could keep my enthusiasm up so far. 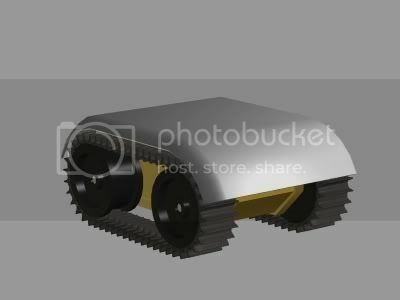 Here is an overall progress of my product so far. I have yet not started with final rendering. dammit, I hate it when he lifts the bar... it makes it soooo hard to focus o the drinks!